What if the spaceships from Star Wars crash-landed on Earth? That opening image from the trailer for Star Wars: The Force Awakens, of an Imperial Destroyer crashed on a planet that is definitely not Tattooine, was probably a more appealing shot than anything from all three of the prequels combined. It stoked anticipation for the possibility that, at long last, there would be new Star Wars movies that are actually good. And now, a Paris-based art director has taken it upon himself to make our own planet look a little more appealing, too. 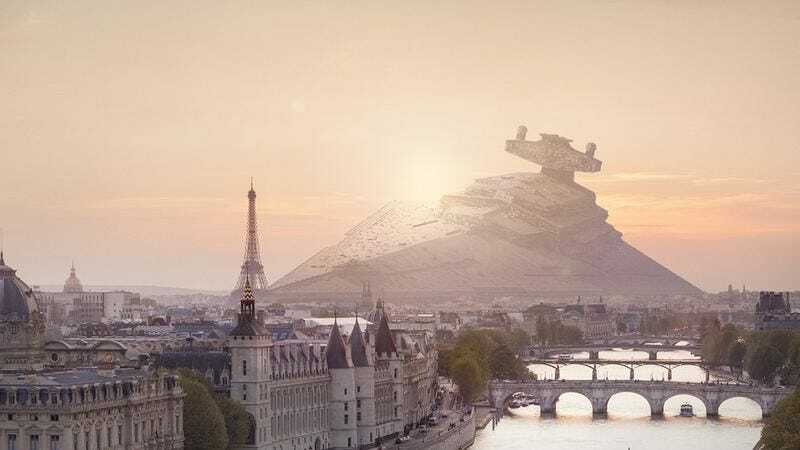 Nicolas Amiard has created images of Star Wars spaceships crash-landing in Paris, New York, San Francisco, and elsewhere. They make for some strikingly cool shots, ones that some of us at The A.V. Club may or may not have already added to our screensaver and background images folders on our computers. Think of them as the aftermath of that “Imperial forces invade Earth” video we posted awhile back.